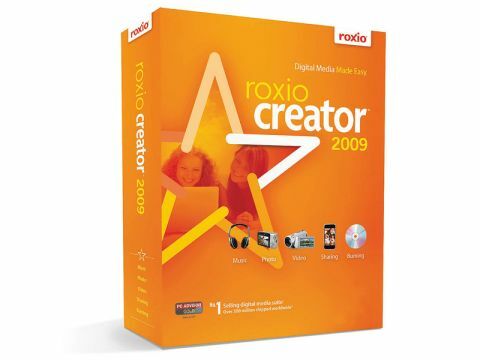 At one time, Roxio Creator was simply a disc burning tool, but it now offers a wide range of audio and video tools. The core tasks are still centred around disc creation, but you'll find support for Blu-ray and AVCHD has been brought to the fore. As with previous editions, this is a hefty install and takes close to 3GB of space for the full edition. Once installed you'll find the new interface is primarily icon-driven, which makes life easier for the first-time user. Roxio has broken each task down into core segments. You'll find Data-Copy, Video- Movie, Music-Audio and Photo sections that perform specific tasks. However, the main change is the new Home page, which allows you to instantly launch basic tasks, such as disc burning or copying, without having to drill down into subsequent menus. Just as with Nero, many of the changes are centred on enhancing audio and video. However, here the templates for creating DVD discs are more plentiful and easier to use and Roxio has put a greater emphasis on tutorials for the first-time user. Rather like Nero's MoveIt software, Roxio's SyncIt! is also a neat tool for converting video and audio for playback on portable devices, such as your iPod or PSP. The tool itself is easy to use and a great way to enhance your daily commute, but in practise it's a rather slow application. With Roxio Creator 2009 you can't help but feel that most people won't get the full benefit out of the many and varied tools on offer – there are simply too many. However, the core tools now handle better and the result is a more powerful and usable package for all users.